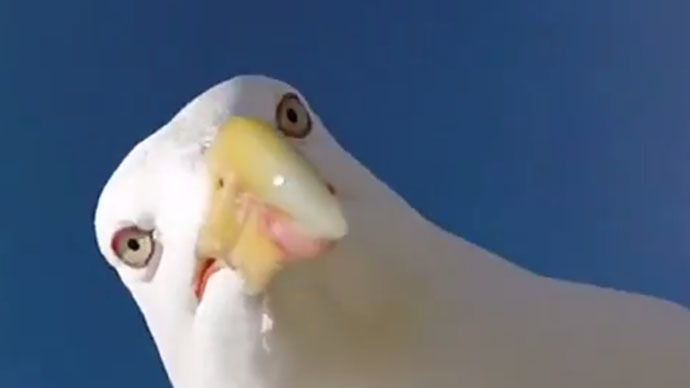 A seagull has filmed the Atlantic coast with a GoPro camera it stole from a German tourist on a Spanish island. At the end it shot a cool selfie, probably better than the camera owner might have taken. The ‘selfie’ incident happened on the Cies Islands in Spanish Galicia when German tourist Martin Lozano was trying to take pictures of the sea view. When he saw a cheeky seagull, he set his camera down on ledge to take some shots of the seabird. The gull grabbed the GoPro and flew away, taking stunning aerial footage of the picturesque coastline. The tourist is heard shouting, but the bird seems to ignore him. Finally, the avian kleptomaniac stopped to take a cool selfie worth thousands of likes on Instagram before abandoning the camera. Lozano managed to grab it back, complete with the gull’s cool video. He uploaded the footage on YouTube on July 8, and it’s gathered at least 600,000 views so far. Animal camera thieves taking selfies have been seen before. In 2014 a monkey in Bali stole a GoPro from an amateur wildlife photographer and took a selfie. The same year, an elephant in West Midlands Safari Park, England, took a dropped phone from a tourist, touched the screen and took a self-portrait.